Canadian Claudia Avon was born in Montreal and now calls Whistler, B.C. home. Growing up, Claudia was heavily involved in ski racing, where she competed at a high level. 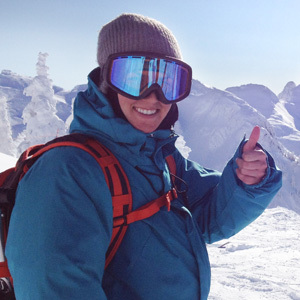 After moving to Whistler, she began to pursue snowboarding. Not long after, she was competing – and winning – snowboarding competitions, culminating in a finals appearance in the 2010 US Open. Nowadays, Claudia focuses most of her attention to exploring the backcountry and filming. Well let me tell you.....It wasn't epic at the time but it sure is a cool story now! My friends and I were at a backcountry hut. We knew there was snow in the forecast but didn't know how much. We woke up and to our surprise we could barely open the cabin door - 70 cm of snow had fallen overnight. It took us 27 hours non-stop trekking to get back to our trucks! I will remember this trip for the rest of my life!!! Looking forward to riding new unknown steep faces with good snow conditions. I must say Xavier De Le Rue is a big one for me. I'm definitely aiming in that general direction with my riding on a long term base. People who are true and go after what they love no matter how hard it can get. Those people are hard to find, but I can always recognize them right away when our paths cross. To me it's simply the best touring binding on the market. It is simple, light, easy to switch over, and gives you a great response on your board. It's a game changer and it makes my trips so much more enjoyable.